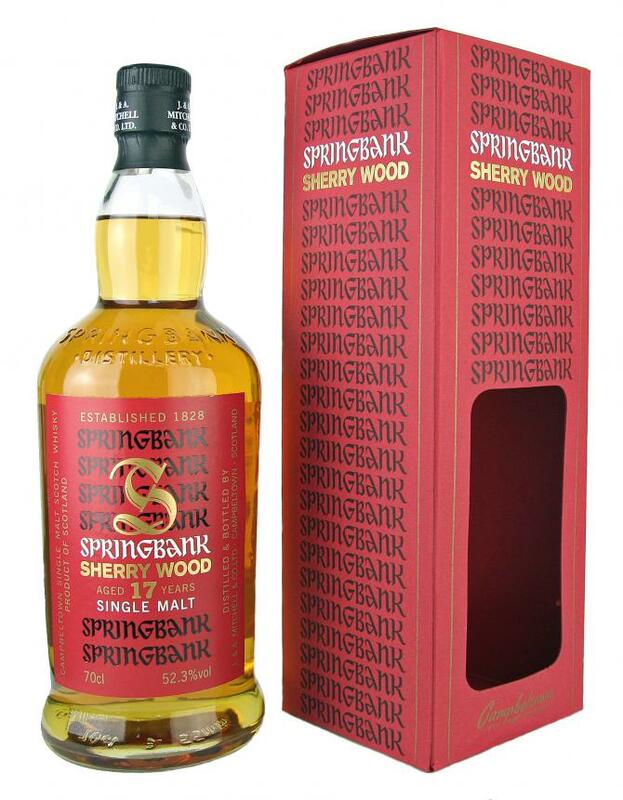 A grand and great Springbank indeed, that does not lose its character despite the influence of the sherry cask. Recommended (despite the heave price tag). Oh, boy, this nose is grand and great. 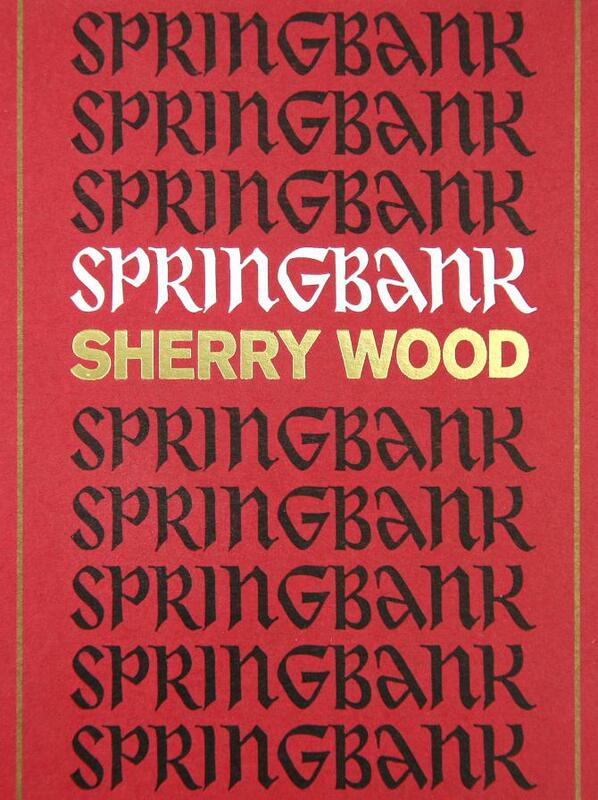 Clearly Springbank with its typical mineral traits and soft peat, but the sherry cask easily takes the lead. All kinds of fruit like raisins, melon, red berries, mango and peach, but also blood oranges and plums. Even krieks. Leave it to breathe for a while and the typical farmy elements emerge at last. The arrival is big, for this is a muscled malt. Spicy on pepper, nutmeg and cinnamon. The fruit still takes the lead and becomes quite dark with krieks, plums, dades and mashed banana. But the smokiness is quite grand too, making this a nice, interesting and especially tasty whisky. Midpalate it shows a bitterness as if from coffee and liquorice, while black chocolate kicks in as well. The finish is long, spicy and a veritable contest between sweet and salt. Mildly drying towards the end. The smoke, in the meantime, lingers. - 66 - 75 - 80 - 82,5 - 85 - 87,5 - 90 - 92,5 - 95) I scored it 85. I took no detailed notes as the whisky did not interest me. The noise is great, but the palate is thin and weak. A real disappointment. I disliked it so much I pawned the rest of it off to brother. His experience was not much better than mine. With water it smells like ginger cake and the palate has a little caramel now. 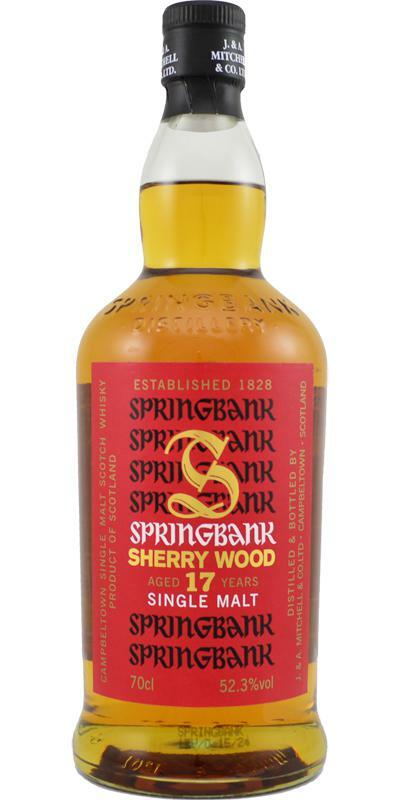 This is a really good Springbank and definitely worth buying. Quite light on honeycomb, peach, nectarine a little custard and a few ham notes. After a while some lovely cherry notes. Mouth filling. waxy and meaty. Peaches like on the nose, whipped cream, yeah its peaches and custard, great stuff. A few notes of rich moist sponge cake and a few syrup notes. 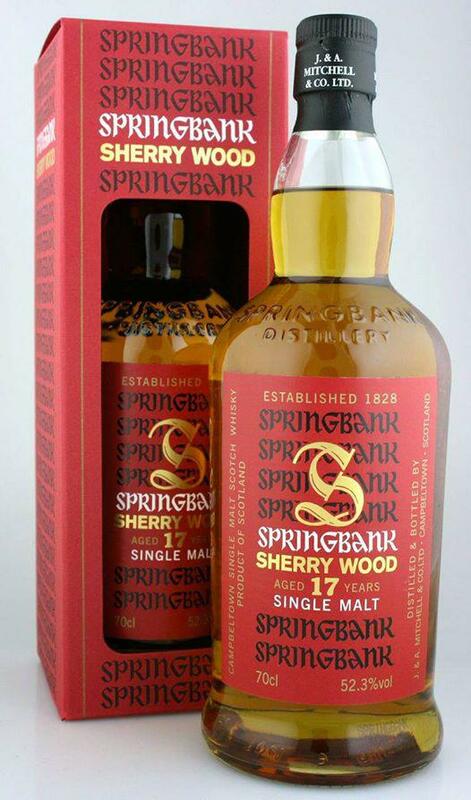 Not the best whisky that Springbank launched the last years. It's not really balanced as it seems to balance between two different profiles. The coherence between nose, palate and finish is a bit lost. Unlike some fellow tasters, I don't recognise and obvious effect of maturation in sherry casks. Or is it yet to come? To me, the wet peat (slightly saline) dominates, with some tobacco, coffee and minerals. Later, there are pineapple and Cola cubes. OK so there might be a sherry effect after all, I admit. Later, there are also melon and moss. This is nice! There is a fight for dominance on the medium to full-bodied palate. I'd say that the mossy peat wins, with marzipan, but also peanuts and crisp lemon. Then orange juice and tobacco. The finish is quite short, drying on ginger and lemon zest. Further, only a mild trace of smoke left, along with licorice root. I remember seeking this out. However, I was disappointed when I opened it. It's good, but the 12CS & 15 year olds are much better than this. 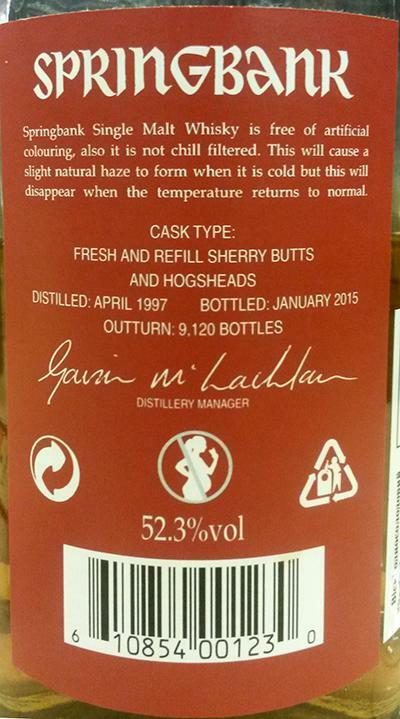 It tastes like the majority of the casks must have been refill American oak sherry hogsheads.